Disney Electric Car Charging Area Catches On Fire- Guests Treated For Toxic Smoke – 8 Cars Burn: TESLA!!!!??? 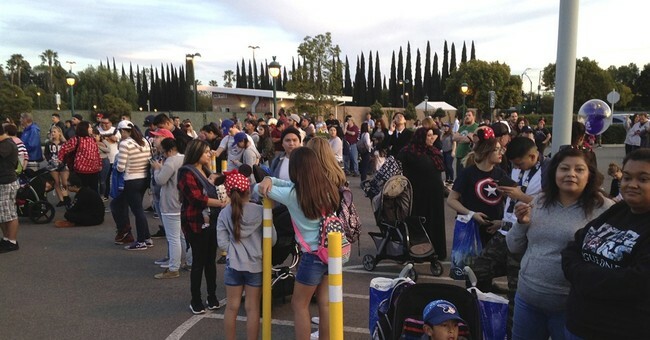 ANAHEIM, Calif. (AP) — A fire broke out in Disneyland’s main parking structure that burned eight cars and caused seven people to be treated for smoke inhalation, authorities said. No foul play was suspected but authorities haven’t given a cause for the Monday blaze at the Mickey & Friends Parking Structure. The Mickey & Friends Structure, with sections named for Disney characters and trams that take visitors to the entrance to the Disney Resort’s two theme parks, is a familiar spot for millions of visitors who pay $18 to park. February 14, 2017 The WIKI Review TeamDisney Electric Car Charging Area Catches On Fire- Guests Treated For Toxic Smoke - 8 Cars Burn: TESLA!!!!?? ?